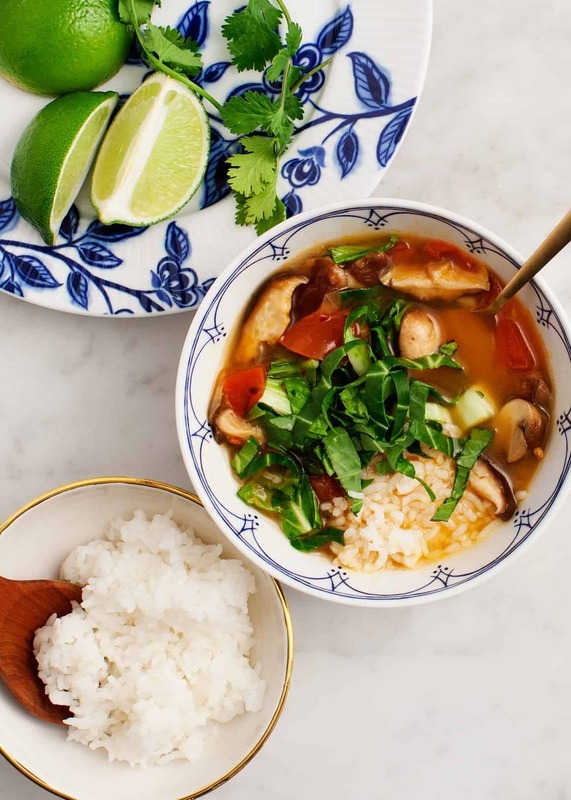 A healthy Thai red curry soup made with ginger, mushrooms, tomatoes, and bok choy. 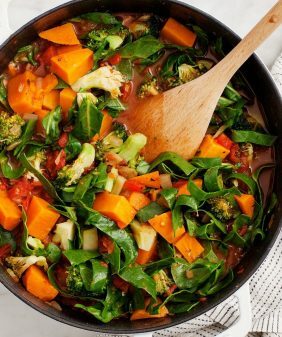 We love this healing vegan & gluten-free soup. We’re nearing the end of soup season here, but I just had to get this one in before we break into summer recipes. Or at least, before we break into cold summer soup recipes and before I go ga ga for gazpacho (ugh, I’m so sorry). 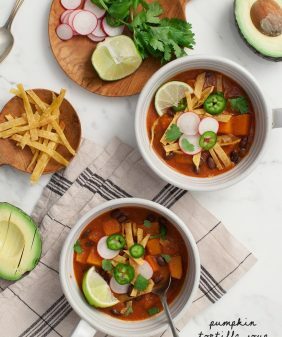 This is a warm and spicy soup for the soul. I first started making it a few months ago when my mom was in town visiting while I was sick. All I craved was soup, so we made tons of soups together. Well, cookies and soups, to be exact. I’m not calling this Thai, because it’s in no way authentic, but there are some delicious Thai-like flavors going on here. It’s inspired by a few versions of Tom Yum (a brothy hot and sour soup) that I’ve been ordering lately at local Thai restaurants. The broth is simmered with ginger and lemongrass and spiced with red curry. The soup is filled with tomatoes, shiitake mushrooms, and lots of crispy bok choy. 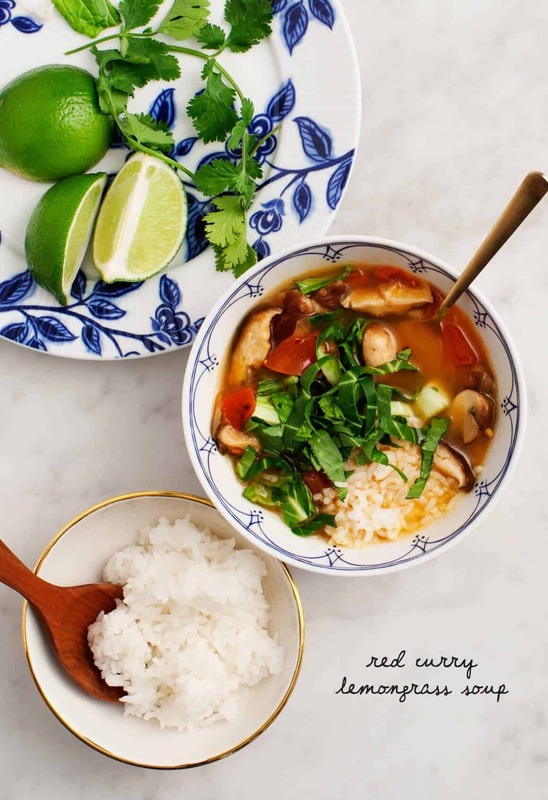 This same soup is also delicious as a red curry coconut soup. If you’re feeling like a more creamy soup, just add a bit of coconut milk. 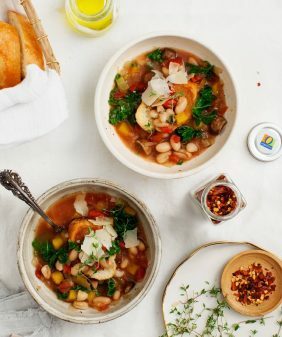 Some days I like my soup creamy, some days I like it brothy – this is a versatile soup, no matter your soup mood. I like to serve this with baked tofu and jasmine rice (you could also use brown rice). Next time, I’m excited to try it with slurpy vermicelli noodles. This warming, versatile soup is inspired by some of my favorite Thai flavors - ginger & lemongrass. Mix in coconut milk for a creamier version, or add baked tofu to make it a meal. The weather in Texas has gone crazy, it’s much cooler today, perfect for a dish like this one. 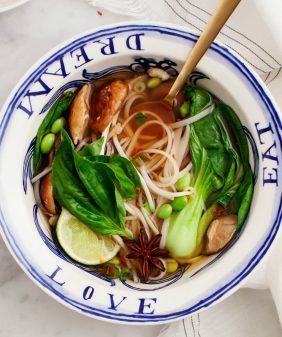 I love the addition of the bok choy, looks so delicious. This. Soup. Gaah! Will be making it tomorrow night. It seems to be soup season 8 or 9 months out of the year here in Switzerland, which I love because soups are a weekly staple in our house. Thanks for the inspiration Jeanine! Absolutely loved this soup. So flavorful and so simple. It will be repeated in our house for sure. Thanks Jeanine! I bet this will be wonderful with noodles! It sounds delicious! That looks so good. And healthy. Where do you buy lemongrass? I order lemongrass everything when going out to eat. I’d love to start cooking with it! Hi Kari, I usually find it at Whole Foods – sometimes in the fresh herb section (which is always best) or in the area with the little boxes of herbs. Interesting recipe, I must try to prepare. Made this soup tonight. I added some shrimps. It was delicious and easy to make. 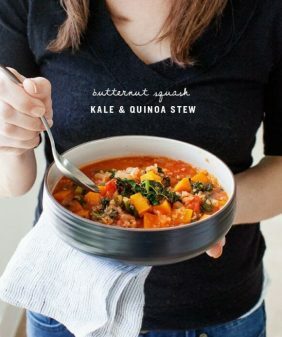 I really love your website and cookbook! This soup looks delicious! I can’t wait to try it. It’s similar to soy sauce except it’s gluten free (you can find it at any grocery store near soy sauces). I made this last week and although its hot in VA its so light its great. I did baby kale because I can’t stand bok choy and added some additional herbs and roasted tomatoes at the end. I will be making again this week for sure. so glad you liked it – thanks for coming back to let me know! After blazing through your cookbook, I was so happy when a friend told me you had a blog! I love tom yum and tom kha! 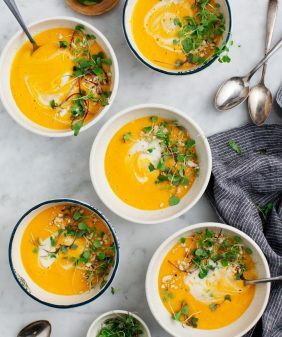 Making this soup right now! Omg it smells divine and it is torturing my husband who has been on a cleanse for two days! Hola desde Argentina!! hice la sopa y estuvo genial!! me encantó! 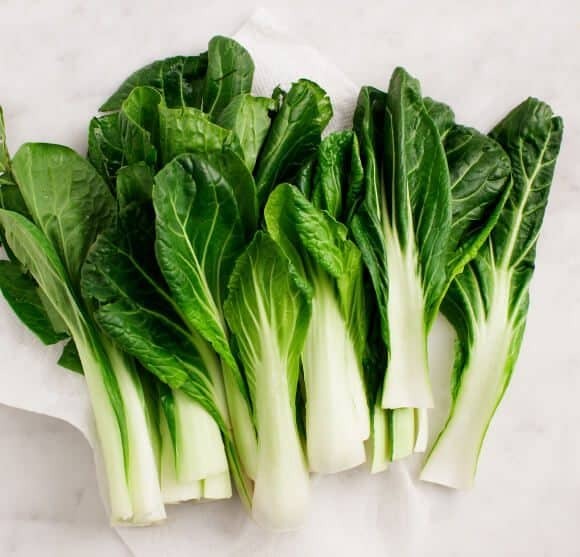 no lo pude hacer con las hierbas de limón y reemplacé bok choy por espinaca. Me imagino que debe cambiar bastante pero traté de hacerla con lo que tenía en casa. Salió exquisita! 😀 Gracias por la receta. Besos! I made this soup this evening. It was quite good, but next time I’ll double the lemongrass, ginger, and red curry paste because we like spicy and bold flavors. I had one bunch of bok choy, not 2, and I think it was plenty. Also I didn’t have tamari but used a coconut derived “soy” sauce. Nevertheless, the soup was quite good, and I’d make it again. Hi Janet, I’m so glad you enjoyed the soup! This was perfect for tonight’s dinner, after several days of treats and holiday foods. Light a fresh, added some broccoli florets to it. Hi Veronica, I’m so glad you loved it!